Heck is a small independent award winning producer of sausages, burgers and meatballs – both veggie and non veggie. They pride themselves on using high quality ingredients and no unnecessary inputs. I’ve tried their veggie burgers and they’re phenomenally good. Now they’ve branched out into veggie meatballs, which come in 255g packs of nine. Both are approved by the Vegan Society and are vegan, gluten free and low in fat. They’re currently available at Waitrose and cost £3 a pack. The Super Greens are also approved by the Vegetarian Society. Thai Bites are made with Thai pesto, sweet potato and sticky rice. They are really tasty, but much as I love Thai flavours I was drawn to the bright green ones – by heck it’s spring and the buds are bursting, I thought, get some chlorophyll inside you. 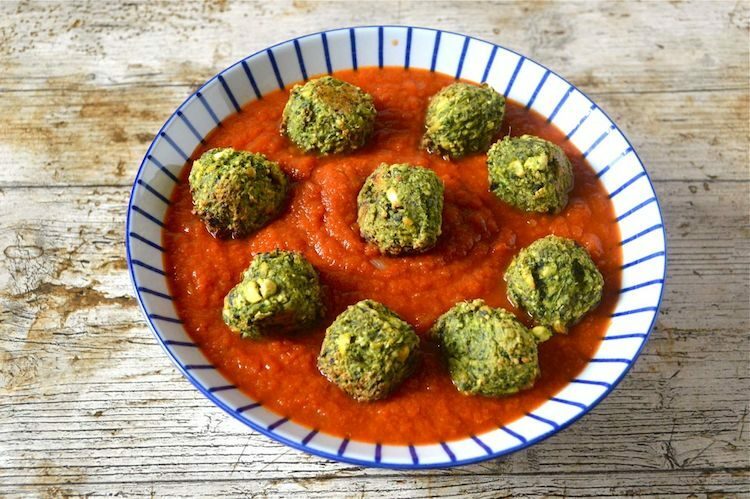 Super Greens are green veggie meatballs made from quinoa, spinach, kale & ginger with a few other nutritious ingredients thrown in for good measure. They’re delicious in their own right and work very well served with a salad. They also help towards the new and seemingly unobtainable target of ten a day. I like a bit of colour contrast when it comes to my food. When I saw these bright green veggie meatballs, I just knew I was going to have to serve them in a bright red tomato sauce. The flavours of the Middle East, I reckoned, would work well with these balls, so that’s what I went for. I made the sauce with red peppers and carrots as well as tomatoes and a little pomegranate syrup. Making the sauce was dead easy. I whizzed most of the ingredients up in my Optimum G2.3 induction blender to produce a thick sauce that the green veggie meatballs could sit in without sinking. I served them on a bed of fruity, nutty rice pilaf which offered a perfect foil to the spicy tomato sauce and earthy balls. The balls are easily cooked in the oven or air fryer and need no oil to bake them. I used my Optimum HealthyFry and they were done to perfection in fifteen minutes. They come out crisp on the outside and gorgeously chewy in the middle. If you’re looking for something to celebrate St Patrick’s Day tomorrow, these green veggie meatballs would make a quick but delicious green dinner. We’ve enjoyed them with lettuce, roasted oca and a green dressing that I’ll be blogging about at some point. However, you could just as well serve them with a more elaborate salad, some new potatoes and dressing of your choice. Tasty and nutritious green veggie meatballs riding on an easy tomato sauce spiced with Middle Eastern flavours. Serve with a fruity, nutty rice pilaff for a perfect feast. Heat the oil in a large deep pan over a moderate heat. Add the onion and fry for five minutes until translucent. Add the cumin seeds, stir and fry for another minute or two. Meanwhile blitz the tomatoes, carrots, red pepper, garlic and chilli in a blender along with the water. Pour into the onion pan and add the pomegranate molasses and salt. Bring to the boil, cover and reduce the heat. Simmer for twenty minutes, stirring occasionally. While the sauce is cooking, cook the veggie balls according to packet instructions or for 15 minutes in an Air Fryer at 180℃. Pour the sauce into a large serving bowl and place the hot balls on top. Serve alongside a Middle Eastern pilaf. Serves 4 very hungry people, but could stretch to 6 more moderate portions. 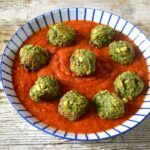 I’m sending this recipe for green veggie meatballs in a spicy tomato sauce off to Jac at Tinned Tomatoes for Meat Free Mondays. This is a sponsored post in collaboration with Heck. I was not expected to write a positive review and all opinions are, as always, my own. Thanks to my readers for supporting the brands and organisations that help to keep Tin and Thyme blithe and blogging. The post contains affiliate links. Buying through a link will not cost you any more, but I will get a small commission. I really must try those. I love your idea of serving them with a tomato sauce. I would love to serve them with spaghetti too. Yes, I think they’d work really well with spaghetti. I was very tempted to go that route. Such a healthy and flavoursome dish! Don’t think I can get my husband to eat green meatballs, but that sauce is definitely a keeper. Excellent, that’s what I like to hear. It’s a super simple recipe to make and you could just have it with pasta. This looks delicious and simple to make, although I did think they were stuffing balls at first! There is never too many recipes for veggie meat balls, if you ask my crowd at the table 🙂 this one will be the great new addition! I made it only with mushrooms and vegetables, served with marinara or something similar, and was looking for something different. And here you come with this beautiful, vibrant and deliciously looking plate full of joy! Thank you, Choclette! Making meatballs has been on my horizon for a long time. Heck beat me to it, but when I do get around to making my own, I’m going to add mushrooms – lovely idea. these look great – meatballs (or cheatballs) are something I would like to make more but don’t – sadly I am not sure these are available in Melbourne or I might just try them. Hahaha, cheatballs, I like it Johanna. Yes, I don’t tend to buy many ready made food products, but these are made with good ingredients and are really tasty. It’s nice to be able to get a few healthy products from the supermarkets these days. The colours of the “meatballs” in that rich tomato sauce look so beautiful. And love the cheatballs nickname from Johanna too! Wow, love the sound of these veggie meatballs. A great alternative to falafels! Yes, they make a very nice change to falafels, delicious as those are. I haven’t tried Heck produces yet, I will give it a go when I am next in the UK. Love your tomato sauce recipe, all looks very tasty! Thank you. I’ve enjoyed all of the Heck veggie products I’ve tried and would definitely recommend them for lazy / busy days. Wow, this looks superb, and I love that you served it with pilaf… which immediately got my mouth watering! I’ve never heard of Heck before but I’m going to look out for them when I visit Britain at the beginning of May! The pilaf was super scrummy. I’ll be posting the recipe at some point. Heck’s veggie range are definitely worth checking out. I must look out for these – love the sauce you made to go with them. I ate kofta a lot when I lived in Egypt, it was so good – I wasn’t vegetarian in those days. They weren’t served in tomato sauce, but I’m sure they could be. I’ve had the Heck cheese and chilli sausages and they were fab. I keep meaning to try the ‘meatballs’ too. Cheese and chilli sausages sounds ace. I’ve been impressed with the products I’ve tried so far.